Paneer butter masala | butter paneer masala, is always a most welcoming accompaniment for roti in my house. I have already posted the recipe of Paneer butter masala but this time wanted to try without onion and garlic. It turned out very well and without noticing any difference my kids polished off the gravy . 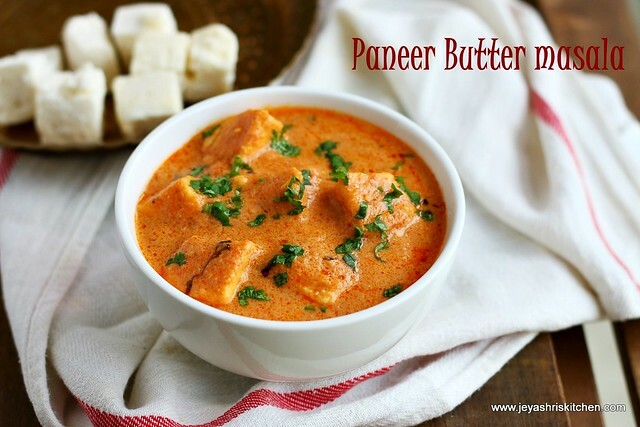 So if you are looking for a side for roti without onion and garlic, then this Paneer butter masala will be a perfect one. Try it out at home and share your views. Stay connected to Jeyashri's Kitchen on facebook for new updates. Check out my other paneer recipes. Grind the tomatoes into puree. Or you can use store bought tomato puree too. Check out home made tomato puree recipe. Soak the cashews in 1/4 cup of hot milk and soak 2 paneer cubes in warm water. Soak for 15 minutes. Grind the cashew and paneer cubes together into a fine paste. Use the milk while grinding the cashews. Add the remaining milk(no need to boil) to this and mix this well. In a bowl add the yogurt, red chili powder, coriander powder, jeera powder, salt and garam masala. In a pan add oil and add the tomato puree . Cook this for 2 minutes. Be careful as the tomato puree will splutter. Keep the flame low. Add the yogurt masala mixture too. Mix well and cook it leaves out oil. Now add the paneer cubes to this. Add 1/2 cup of water to this and cook it for 5 minutes in a medium low flame. Now add the cashew milk mixture. You can replace this with 3 tblsp of fresh cream too. Keep the flame low and add the crushed kasoori methi . Garnish with some coriander leaves.Add a tsp of butter to this when it is hot. Paneer butter masala is ready to serve. You can replace tomatoes with 1/2 cup tomato puree. Again the measurement depends on how strong, thick your puree is. 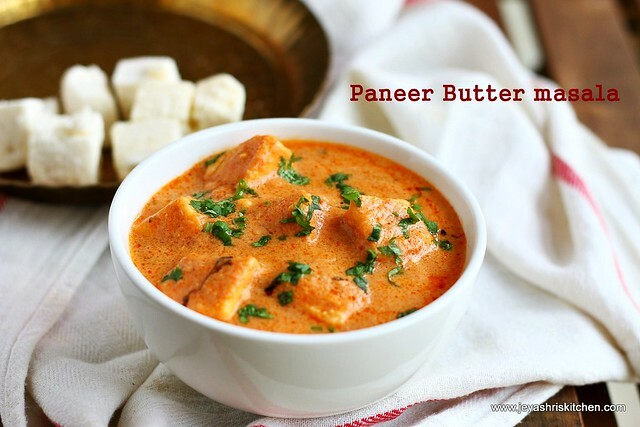 Do not boil the paneer butter masala after adding the cashew milk mixture. Else it will curdle. Instead of milk, cashew and paneer you can add only thick milk to the gravy. But cashew and paneer make it more rich. You can add a slit green chili to this gravy before adding tomato pure. If needed cut bellpepper | capsicum can be added . You can either cut this into cubes and add to the gravy or saute the cubes in little oil for few minutes and then add. 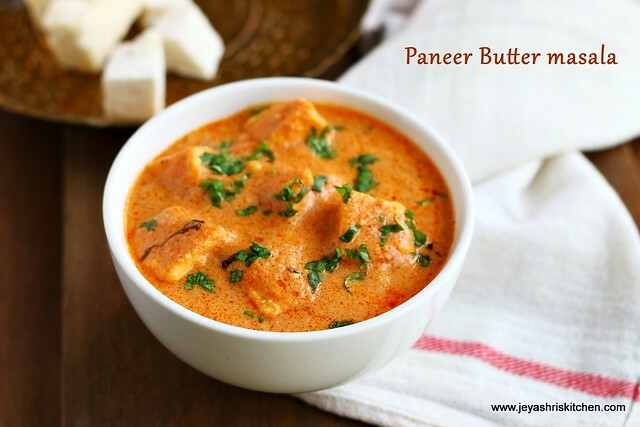 Technorati Tags: paneer butter masala,no onion no garlic paneer butter masala,no onion no garlic recipes,northindian recipes,paneer recipes jeyashris kitchen,how to make paneer butter masala,paneer butter masala jeyashris kitchen. Looks very appetizing. Will try and let u know. Madam I m shreya and I want to try this one. Instead of paneer can we do the same with tofu? Or if I take tofu will the procedure change? Can you please tell me? Perfect recipe....It came out well..
Hello mam,when u say one cup it can be of any size or is there any specific measurement for it? Hi ,please check i have given. It has to be added with the yogurt.